On Thursday I was not feeling well. After getting home I simply took everything in the fridge and turned it into salad. I can tell I am sick when I make nothing but a giant salad for dinner and simply watch Jen eat it as I look on lethargically. This particular salad was perhaps one of my finest of the kale variety. 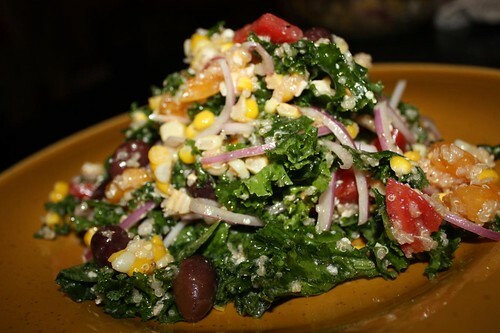 It had kale, grilled corn, red onion, kalamata olives, feta cheese, heirloom tomato, and quinoa. Yesterday was a day of great sadness. I spent most of the day sleeping and watching movies on and off all day. 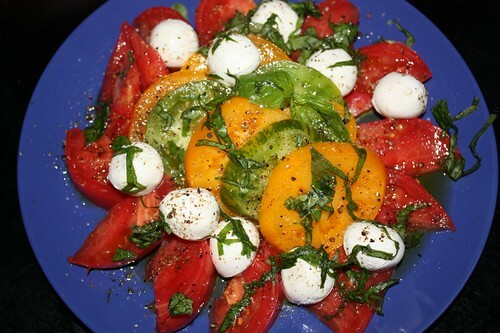 Today I slowly regained my strength over the course of the day until, at dinner, I made a fantastic heirloom tomato salad with mozzarella, basil, olive oil, salt, pepper, and fresh bread. 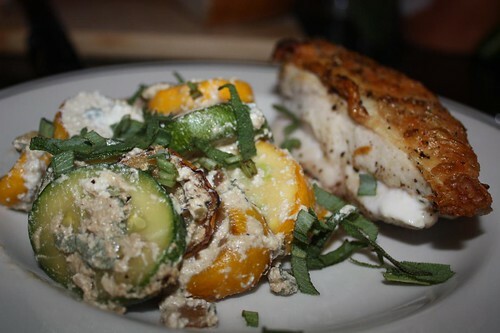 For the main course I pan roasted a chicken breast and cooked up some zucchini with fresh sage (from my mother's garden), garlic, and ricotta. The zucchini was from the same farmer's market visit last weekend where I purchased the corn. This was a very tasty main course but after the fantastic tomatoes as a first course it was just a little anti-climactic. Next time I'll serve the zucchini and chicken first with the heirloom tomatoes as the main course. Look out convention, I'm about to buck you.